Get WHIT It and Get Eco-Friendly! 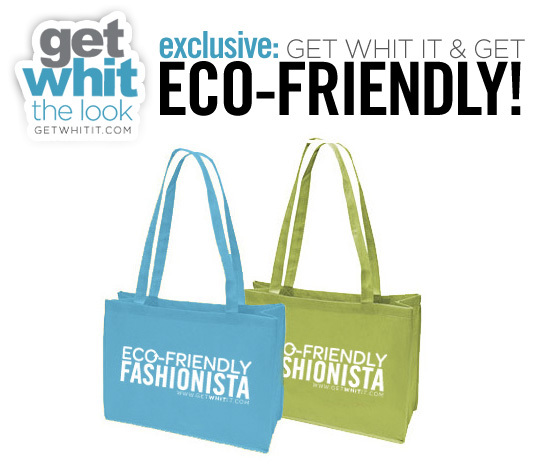 Just in time for holiday shopping season, it's time to Get WHIT It and get eco-friendly! We want you to enjoy shopping while making a statement! Our "Eco-Friendly Fashionista" bags, made from recycled material, come in two eye-catching colors - blue and lime green. Bring one along with you as you begin your holiday shopping (they are also great for traveling)! The bags will be available exclusively to our email list subscribers tomorrow (Tuesday, November 14) via pre-sale, and then to everyone on Wednesday (November 15)! The price - only $5 (includes shipping) per bag, so order one or grab both colors! They also make great gifts for your shop-a-holic friends or family members! If you want to be able to order before everyone else, please make sure you are signed up for our Insider Newsletter!